Even if your home is filled with gorgeous antique tables, at some point you’re going to want to shoot your food on a surface you don’t have. And if you live in a state where you have to chase the sun for natural light, a portable food backdrop board is essential. While I am a devoted dumpster diver when it comes to finding beautiful, weathered planks of wood, when I wanted to photograph strawberries on a bright blue table, I had to make one. There are two ways to make a backdrop board for food photography: glue smaller planks together so the end result has nice deep vertical lines like on a picnic table or just use a solid piece of thin wood. The former is a bit more expensive, takes longer, and is a little heavier. The latter is cheaper, faster, and lighter. Guess which route I went? 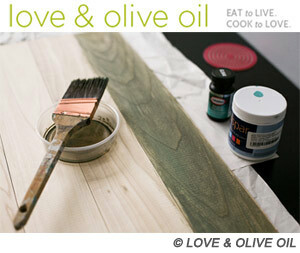 Love & Olive Oil has a fantastic tutorial on how to make a backdrop using individual planks. 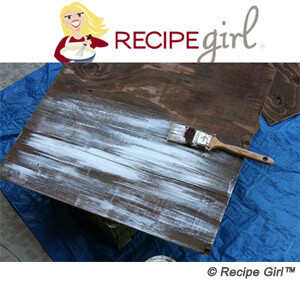 Recipe Girl has an equally wonderful tutorial on how to make a backdrop using a single piece of wood. I followed Recipe Girl’s instructions and got 6 beautiful surfaces. 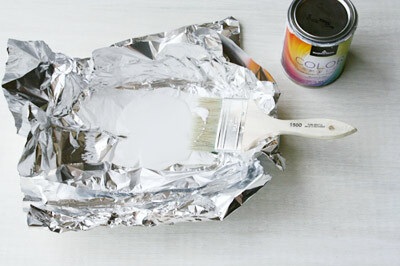 I bought the pieces of wood at our local hardware store for just $6 each, found the colored paint in the rejected returns shelf in the paint department for 50 cents, and as you can see from the photo at the top of this post, made my own paint trays out of aluminum foil.